Have you wanted to learn how to free-motion quilt, but just were not sure where to start?? This is the perfect class for you! Join Pat as she teaches you the beginning steps and techniques to free-motion quilting! Click here for your Class Supply List. 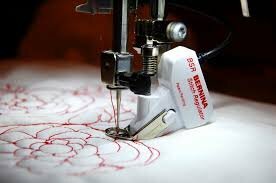 We are so excited to be offering free-motion quilting classes this season! Come join Pat Roland who has been sewing since junior high school and quilting for the last 15 years. She began experimenting with free-motion quilting about ten years ago and loved it from the start. Coming to Oregon gave her the opportunity to attend Quilters Affair classes. She has had the opportunity to take workshops with Libby Lehman - Ribbons, Cindy Needham - Beginning and advanced free-motion quilting, and Barbra Shapel - Two sided thread painting. She been teaching in Arizona for three years and loves sharing what she has learned over the years with quilters of all levels!